When yesterday over 92 percent Activision shareholders gave their thumbs-up to the company's pending merger with Vivendi, it was pretty much a done deal, and today Activision Blizzard is official. Board chairman Rene Penisson said he's "delighted that the merger is completed," and that the new company is "determined to 'think big!'" The merger was first announced in December of 2007. Through it, Blizzard and Sierra parent Vivendi becomes a wholly-owned subsidiary of Activision, scoring 295.3 new shares of Activision stock. It'll also buy 62.9 million new shares for a total of $1.7 billion - the result is that Vivendi owns a stake of about 52 percent in its new parent company. PARIS & SANTA MONICA, Calif., Jul 10, 2008 (BUSINESS WIRE) — Vivendi (Euronext Paris: VIV) and Activision, Inc. (Nasdaq: ATVI) today announced the completion of the transaction announced on December 2, 2007 to create Activision Blizzard, as the world's most profitable pure-play online and console game publisher. Activision Blizzard was formed by combining Activision, one of the world's leading independent publishers of interactive entertainment, and Vivendi Games, Vivendi's interactive entertainment business, which includes Blizzard Entertainment's(R) World of Warcraft(R), the world's #1 subscription-based massively multiplayer online role-playing game. 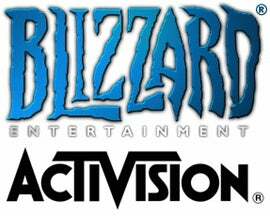 Activision Blizzard will continue to operate as a public company traded on Nasdaq under the ticker ATVI. Jean-Bernard Levy, CEO of Vivendi, said: "We have created the world leader in online and console games with this transaction and the combined strengths of the two businesses offer immense growth potential. I am also very confident that, with the new leadership team in place, the new entity is perfectly positioned to take advantage of these rapidly developing markets across the globe." Rene Penisson, Chairman of Activision Blizzard, added: "We are delighted that the merger has been completed. We are very excited about the opportunity for Activision Blizzard to create a broader entertainment software platform. We are leaders across North America and Europe and are creating a substantial footprint in the rapidly growing Asian market. We are determined to 'think big'!" "The completion of this transaction marks the beginning of an important new chapter in the history of interactive entertainment," said Robert Kotick, President and Chief Executive Officer of Activision Blizzard. "By combining leaders in mass-market entertainment and subscription-based online games, Activision Blizzard has leading market positions across all categories of the rapidly growing interactive entertainment software industry. With more than 10.7 million subscribers on World of Warcraft, and with tens of millions of people playing Guitar Hero, Activision Blizzard's games are transcending the traditional stereotypes and are more popular as a form of entertainment than ever before. We look forward to building upon our brands to create value for our shareholders, customers and consumers." "From the beginning, our goal has been to make the best games in the world, and this transaction strengthens our ability to do just that," said Mike Morhaime, Blizzard Entertainment cofounder and Chief Executive Officer. "As part of Activision Blizzard we'll have the reach and resources to share our games with an even wider audience — while maintaining the same approach as always to providing high-quality entertainment and services to our players." In addition to World of Warcraft, the #1 subscription-based massively multiplayer online role-playing game, the transaction brings together some of the world's leading interactive entertainment franchises including Guitar Hero(R), the #1 family entertainment and #1 music-based franchise; Call of Duty(R), the #1 first-person action franchise; Tony Hawk, the #1 action sports franchise; Spider-Man, the #1 Super Hero franchise; Cabela's(R), the #1 sports hunting franchise; and two of the top-ten kids movie-based franchises, Shrek and Madagascar(TM), for calendar year 2005 through 2007 according to the NPD Group, Chart Track and The GFK Group. The transaction was approved by Activision's stockholders at a special stockholder meeting on July 8, 2008 and closed on July 9, 2008. Under the terms of the agreement, Vivendi Games merged with a wholly owned subsidiary of Activision and shares of Vivendi Games were converted into approximately 295.3 million new shares of Activision common stock. Concurrently with the merger, Vivendi purchased approximately 62.9 million newly issued shares of Activision common stock at a price of $27.50 per share for a total of approximately $1.7 billion in cash, resulting in a total Vivendi ownership stake in Activision Blizzard of approximately 52% on a fully diluted basis and approximately 54% of shares outstanding. In accordance with the terms of the agreement, within five business days of the closing of the transaction, Activision Blizzard will launch a $4 billion all-cash tender offer to purchase up to 146.5 million Activision Blizzard common shares at $27.50 per share. To the extent that Activision's stockholders participate in the tender offer, the tender offer may be funded with Activision Blizzard's available cash on hand at closing, borrowings made under credit facilities from Vivendi, and proceeds from the issuance of additional shares to Vivendi for up to $700 million. If the tender offer were fully subscribed, Vivendi would own an approximate 68% ownership stake in Activision Blizzard on a fully diluted basis. The transaction is expected to be immediately accretive in its first year post-closing for Activision's stockholders on a non-GAAP basis excluding equity-based compensation, one time costs related to the transaction, the impact of purchase price accounting related adjustments including amortization of intangibles, and the impact of the change in deferred net revenues and cost of sales related to online-enabled games. Both Activision and Blizzard Entertainment's businesses have maintained their momentum and Activision Blizzard is well positioned to exceed the financial goals set for the combined company at the time of the deal announcement. The Board of Directors of Activision Blizzard consists of eleven members: six directors designated by Vivendi, two Activision management directors and three independent directors from Activision's board of directors. Rene Penisson, a member of the Management Board of Vivendi and Chairman of Vivendi Games, will serve as Chairman of Activision Blizzard. Brian Kelly, Co-Chairman of Activision, will serve as Co-Chairman of Activision Blizzard. The three independent directors are Richard Sarnoff, Robert J. Corti and Robert Morgado. Other Activision Blizzard directors will be Robert Kotick (President and Chief Executive Officer of Activision Blizzard), Bruce Hack (Vice-Chairman and Chief Corporate Officer of Activision Blizzard), Jean-Bernard Levy (Chairman of the Management Board and Chief Executive Officer of Vivendi), Doug Morris (Member of the Management Board of Vivendi and Chairman and Chief Executive Officer of the Universal Music Group), Philippe Capron (Member of the Management Board and Chief Financial Officer of Vivendi), and Frederic Crepin (Senior Vice President, Head of Legal Department of Vivendi). Activision Blizzard is drawing on an accomplished group of leaders from both companies: Robert Kotick is President and Chief Executive Officer of Activision Blizzard. Mike Griffith is serving as President and Chief Executive Officer of Activision Publishing, which includes the Sierra Entertainment, Sierra Online and Vivendi Games Mobile divisions in addition to the Activision business. Bruce Hack, who served as Chief Executive Officer of Vivendi Games, is Vice-Chairman and Chief Corporate Officer of Activision Blizzard, accountable for leading the merger integration and the finance, human resources and legal functions. Blizzard Entertainment cofounder, Mike Morhaime, will continue to serve as President and Chief Executive Officer of Blizzard Entertainment. Thomas Tippl, formerly Chief Financial Officer of Activision Publishing, has been appointed Chief Financial Officer of Activision Blizzard and Jean-Francois Grollemund, Chief Financial Officer of Vivendi Games, has been appointed Chief Merger Officer of Activision Blizzard. Activision Blizzard's portfolio includes best-selling video games such as Guitar Hero(R), Call of Duty(R), and Tony Hawk, as well as Spider-Man(TM), X-Men(TM), Shrek(R), James Bond(TM) and TRANSFORMERS(TM), leading franchises such as Crash Bandicoot(TM) and Spyro(TM) and Blizzard Entertainment's(R) StarCraft(R), Diablo(R), and Warcraft(R) franchises including the global #1 subscription-based massively multi-player online role-playing game, World Of Warcraft(R). Activision Blizzard maintains operations in the U.S., Canada, the United Kingdom, France, Germany, Ireland, Italy, Sweden, Spain, Norway, Denmark, the Netherlands, Romania, Australia, Chile, India, Japan China, Taiwan and South Korea. More information about Activision Blizzard and its products can be found on the company's website, www.activisionblizzard.com. THIS DOCUMENT IS FOR INFORMATIONAL PURPOSES ONLY AND IS NOT AN OFFER TO BUY OR THE SOLICITATION OF AN OFFER TO SELL ANY SECURITIES. THE SOLICITATION AND THE OFFER TO BUY SHARES OF ACTIVISION BLIZZARD'S COMMON STOCK WILL ONLY BE MADE PURSUANT TO AN OFFER TO PURCHASE AND RELATED MATERIALS THAT ACTIVISION BLIZZARD INTENDS TO FILE WITH THE SEC. ONCE FILED, ACTIVISION BLIZZARD STOCKHOLDERS SHOULD READ THESE MATERIALS CAREFULLY PRIOR TO MAKING ANY DECISIONS WITH RESPECT TO THE OFFER BECAUSE THEY CONTAIN IMPORTANT INFORMATION, INCLUDING THE TERMS AND CONDITIONS OF THE OFFER. ONCE FILED, ACTIVISION BLIZZARD STOCKHOLDERS WILL BE ABLE TO OBTAIN THE OFFER TO PURCHASE AND RELATED MATERIALS WITH RESPECT TO THE OFFER FREE OF CHARGE AT THE SEC'S WEBSITE AT HTTP://WWW.SEC.GOV, OR FROM THE INFORMATION AGENT NAMED IN THE TENDER OFFER MATERIALS. Cautionary Note Regarding Forward-looking Statements: Information in this press release that involves Activision Blizzard's expectations, plans, intentions or strategies regarding the future are forward-looking statements that are not facts and involve a number of risks and uncertainties. In this release, they are identified by references to dates after the date of this release and words such as "outlook", "will," "remains," "to be," "plans," "believes", "may", "expects," "intends," and similar expressions. Factors that could cause Activision Blizzard's actual future results to differ materially from those expressed in the forward-looking statements set forth in this release include, but are not limited to, sales of Activision Blizzard's titles in its fiscal year 2009, shifts in consumer spending trends, the seasonal and cyclical nature of the interactive game market, Activision Blizzard's ability to predict consumer preferences among competing hardware platforms (including next-generation hardware), declines in software pricing, product returns and price protection, product delays, retail acceptance of Activision Blizzard's products, adoption rate and availability of new hardware and related software, industry competition, rapid changes in technology and industry standards, protection of proprietary rights, maintenance of relationships with key personnel, customers, vendors and third-party developers, domestic and international economic, financial and political conditions, foreign exchange rates, integration of recent acquisitions and the identification of suitable future acquisition opportunities, Activision Blizzard's success in integrating the operations of Activision and Vivendi Games in a timely manner, or at all, and the combined company's ability to realize the anticipated benefits and synergies of the transaction to the extent, or in the timeframe, anticipated. Other such factors include the further implementation, acceptance and effectiveness of the remedial measures recommended or adopted by the special sub-committee of independent directors established in July 2006 to review historical stock option granting practices by Activision Blizzard and its board of directors, the finalization of the tentative settlement of the SEC's formal investigation and final court approval of the proposed settlement of the derivative litigation filed in July 2006 against certain current and former directors and officers of Activision Blizzard relating to Activision Blizzard's stock option granting practices, and the possibility that additional claims and proceedings will be commenced, including additional action by the SEC and/or other regulatory agencies, and other litigation unrelated to stock option granting practices and any additional risk factors identified in Activision Blizzard's most recent annual report on Form 10-K and quarterly reports on Form 10-Q and the definitive proxy statement filed on June 6, 2008 in connection with the proposed transaction with Vivendi. The forward-looking statements in this release are based upon information available to Activision Blizzard as of the date of this release, and Activision Blizzard assumes no obligation to update any such forward-looking statements. Forward-looking statements believed to be true when made may ultimately prove to be incorrect. These statements are not guarantees of the future performance of Activision Blizzard and are subject to risks, uncertainties and other factors, some of which are beyond its control and may cause actual results to differ materially from current expectations.